I’ve been watching a lot of early Stanley Kubrick films. Films like Killer’s Kiss, Paths of Glory, The Killing, and Dr. Strangelove. There’s a character actor in Paths of Glory and The Killing named Timothy Carey. He is one of the most bizarre actors ever. He usually speaks through gritted teeth. I mean he hardly ever opens them. He always adds the weird to every character he plays. Here’s a scene from a John Cassavetes film, Minnie & Moskowitz. He auditioned for the boss in Reservoir Dogs. But Tarantino was afraid to work with him. But he dedicated it to Carey and several of his cinematic influences. Carey directed a 1962 film, The World’s Greatest Sinner. It’s a low, low, low budget movie, scored by a young, pre-Mothers Frank Zappa. It offended 1962 audiences so bad, it was not theatrically released. It’s so rare and obscure, I’ve never seen it. 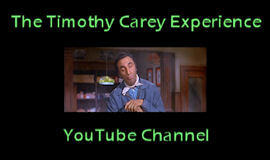 Any way for your pleasure, here’s a caricature of late, great, and wacko Timothy Carey. Thanks for looking. . . and sorry about the long windedness.